Closely supervise children when they are around cars to prevent them from playing and becoming locked in the trunk where they could be seriously injured. Keep the car locked, with the rear seatback and trunk lid securely latched when not in use, and prevent children’s access to car keys. The interior trunk lid release mechanism provides a means of escape for children and adults in the event they become locked inside the trunk. 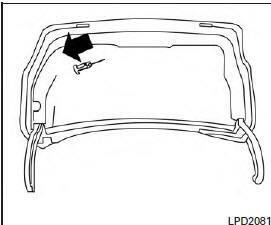 To open the trunk from the inside, pull the illuminated release handle until the lock releases and push up on the trunk lid. The release handle is made of a material that glows in the dark after a brief exposure to ambient light. The handle is located inside the trunk compartment on the interior of the trunk lid.